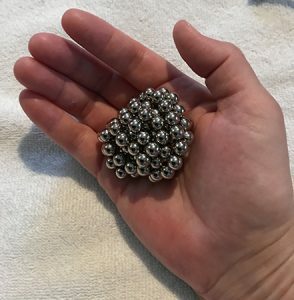 About this product Extremely powerful, rare Earth, neodymium magnets. They are not suitable for children under 12. Choking and swallowing hazard. Please use with adult supervision. Comes with a handy carrying pouch. 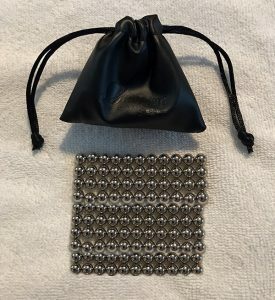 Whether creating fun patterns and shapes for stress relief or using them to organize your cubicle, these large heavy duty magnets have a sleek modern look and feel. Keep everyone’s attention on long rides, compete with your friends to create the most complicated structure, adorn your fridge or file cabinet, millions of functional uses. Color is solid – won’t rub off. Makes a fantastic gift for office-mates. Especially in a cube farm!